Sawatdii ka, On May 31st every year is World No Tobacco Day วันงดสูบบุหรี่โลก [wan ngód sùup bù-rìi lôke ]. The member states of the World Health Organization (WHO) created World No Tobacco Day in 1987, highlighting the health risks associated with tobacco use and advocating for effective policies to reduce consumption. Tobacco use is the second cause of death globally (after … [Read more...] about Learn Thai- Do you smoke? Thai superstition – Why no haircuts on Wednesday? Sawatdee ka, Have you ever heard that it is unlucky to get a haircut on a Wednesday in Thailand? Most hair salons are closed or the hairdressers get a day off every Wednesday. I have read a cause of this superstition, in the ancient times people believed that Wednesday was the day of growth and development, it was also considered auspicious time. The members of royal family … [Read more...] about Thai superstition – Why no haircuts on Wednesday? Sawatdee ka, I posted a question on my Facebook page asking " Do you know what "cheers!" is in Thai? ", and I got many different answers as showed below: - ชน [chon] literally means crash against, bump against, knock against. It is also commonly used for "cheers!". Many times we say the word เอ้า! [âo!] 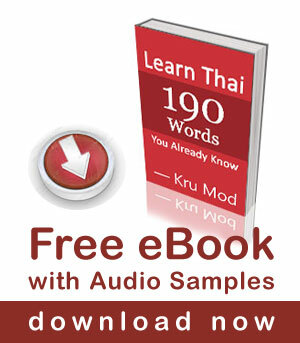 before ชน [chon] which is an encouraging sound meaning like … [Read more...] about Learn Thai – Cheers!